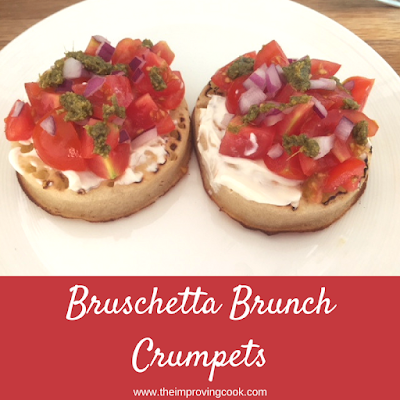 Bruschetta Brunch Crumpets- an easy brunch recipe for summer, using some classic bruschetta flavours, and it takes less than 10 minutes to make. Now that's a quick meal! I don't often get the chance to have brunch but it's always a treat. That perfect mix of breakfast and lunch foods- yum. This is such an easy brunch recipe, but it looks just a little but fancy, as though you've made lots of effort. So, if you serve it up to others they should be impressed! 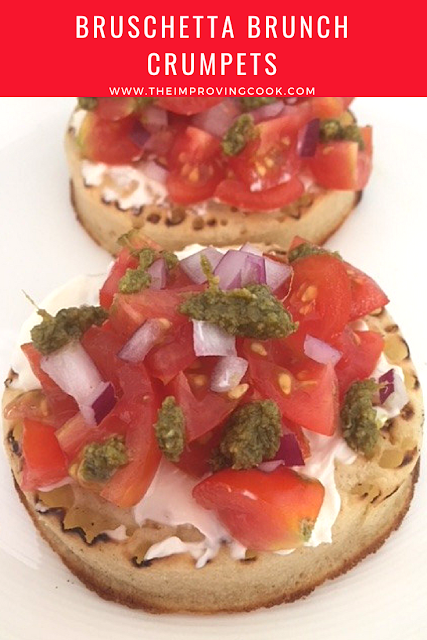 To make Bruschetta Brunch Crumpets, you simply toast your crumpets, spread a good layer of cream cheese on them, top with cherry tomatoes and red onion and finally drizzle with some pesto. See- such an easy recipe! Serve it with some fruit and you've got brunch in just a few minutes. It's so quick that you can decide to make it on a whim, no need to plan ahead. If you want it to be truly vegetarian, you'll need to get a special pesto as most are not vegetarian due to the parmesan content. Bruschetta Brunch Crumpets- an easy brunch recipe for summer, using some classic bruschetta flavours, and it takes less than 10 minutes to make. Spread half a tablespoon of cream cheese on each crumpet. Chop each tomato into 8 and finely dice the red onion. 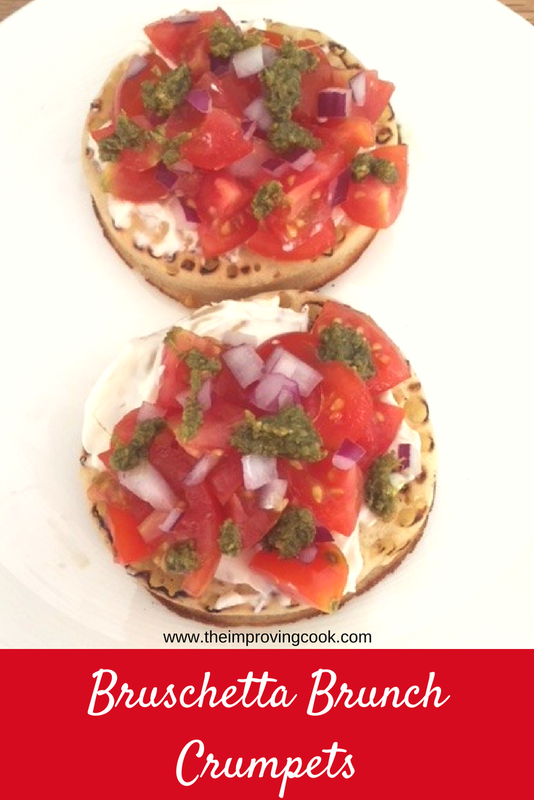 Sprinkle the tomato (about 2 tomatoes- 16 pieces per crumpet) and onion on the crumpets. Drizzle the pesto over the top. If you have the thicker pesto, dab it in small blobs across the top.